I know that the topic of metal in straw bale wall assemblies is a contentious one, and that is precisely why I want to bring it up and talk about it with you all. I have been saying for years that the use of welded wire mesh and plaster lath is essential to a quality bale house, and that sentiment has not changed. Wall Strength. This is the most obvious of reasons for people who have built with the metal before. There is nothing that tightens up a straw bale wall quite as well as applying welded wire mesh over both wall surfaces and then tying the mesh tightly together. The out of plane (forces applied perpendicular to the wall surface) and lateral (forces applied in line with the wall surface) strengths of a bale wall system are greatly increased with the use of mesh. Further, there is no need for internal or external pinning to hold the bales in place when using mesh, so the practice not only increases strength, but also eases and speeds construction. Electrical Installations. The old system of vampire spikes simply doesn’t work well. By utilizing the mesh as an anchor point, small plywood plates that hold the electrical boxes are permanently attached to the wall and cannot move once installed. This is a simple and effective way of installing electrical work to any bale wall. Cabinet Backing. 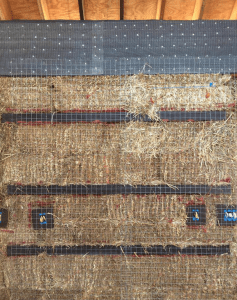 By installing horizontal 2x4s (or larger) into the bales and then attaching them to the wall by means of the mesh that overlays them, one can create a permanent backing for heavy items that will eventually be anchored to the wall. This could be cabinets, large mirrors, artwork, or anything that requires extra support. Shaping. Bale buildings are known for their beautiful shapes. Welded wire mesh is the best way to get the shapes you want because it does not stretch when installed. You can apply a lot of force to the mesh to get very tightly packed curves, thus creating solid backing for the plaster application. Stuffing. Every bale wall needs to be stuffed from time to time in between bales or other areas where the backing for the plaster isn’t quite adequate. Stuffing that is applied to the wall without anything to hold it in place, such as mesh or lath, will simply fall out of the wall once the plaster adheres to it under the weight of the plaster. Even if it doesn’t fall out, you can be sure that it is not offering any positive attachment for the plaster, so it surely is not helping the situation. Okay, I know I said 5 reasons, but this one is important too: Spanning Over Wood. When plaster has to span over wood elements of the structure (posts, beams, etc. ), it needs a way to anchor to the wall. Asking plaster to stick to wood is a bad idea because the wood will expand and contract over time, causing cracks in the plaster. Hoping that the plaster will span across the framing members from straw bale to straw bale is risky too because plaster is not designed to handle that kind of stressful span. Instead, applying plaster lath over a waterproof membrane (roofing felt, for example) on top of the wood elements provides the strength and durability your home needs. Okay, there are my five (plus one) main reasons for using mesh. I have others, but I said I was going to keep it short and sweet. So, what are your thoughts? Here a question from a follower in Holland. Did you think about the consequence of being your home a cage of Faraday, because of using the metal mesh? Maybe one can consider using plastic mesh? This is a very interesting read! Friends of ours just finished constructing their straw bale home exactly like you do it: With metal mesh over all the walls. Richard attended your West Australian workshop last year for hands-on experience. We, on the other hand, only came upon your DVD after the straw bale side of things had been worked out for us by an Australian straw bale architect, using a successful local method of compressing bales every 400mm with wire loops that run beneath the wall through the timber toe-ups and over the wall every 6 bale courses with trench mesh as a compression plate. The wires are then grippled tight over several days, compressing the wall into an immovable unit. Mesh is applied only over areas that need shaping, such as window and door reveals, and also immediately around power points (pinned in and used in addition to sharp wooden pegs rammed into the wall to stabilize the power boxes). Interior dividing walls of brick or plasterboard largely result in conventional cabinet attachment, and where we forgot to provide wooden backing to screw curtain rails into, we’ve gone back and driven thick, long timber dowelling into the walls to attach to, which isn’t as good as solid timber but works OK as long as nobody swings off the curtain rods. Both systems worked fine, and have advantages and disadvantages. Richard and Ashley’s walls are much flatter than ours, which allowed them to plaster more quickly and achieve a smooth plaster finish, and have all the attachment and other advantages you wrote about. Our walls had more variation in them and no flat reference face via metal mesh, and so we ended up using more plaster overall, and having a little curvature in our walls. The final coat was therefore rustic plaster with the tool-marked surfaces typical of peasant plastering. We finished the walls with a flexible, round-edged plastic float to get rid of the hard trowel marks and leave a softer-textured finish. It does suit our farmhouse, and visitors like it, but it’s definitely not a professional flat finish like Richard and Ash’s. So if that’s what people are aiming at, then I would recommend meshing all the walls with your method just from the perspective of getting that kind of plaster finish. Brett was concerned about wireless Internet reception, and internal wireless transmission, inside all-meshed houses. Do you have any case studies of whether these are affected, especially in marginal reception areas? Your DVD, by the way, was still the best resource by far we had for actually building and plastering our straw bale walls, even though we used a different system. In the absence of good workshops in our area at the time, and as total novices, it was our go-to safety line we watched again and again before we did anything. We’re now around 85% complete, and will let you and Gabriella know when we are done. We’ve been watching your tiny house projects with interest and love your philosophy. Merry Christmas and a wonderful New Year to you, Gabriella and family! Hi Ger. Good question and thanks for asking. I have considered this and it is not an issue. A Faraday cage needs to be complete and this is not. The metal mesh does not form a completely closed circuit and so the effects are not present. I have used plastic mesh in the past as well and it is not as good as the metal mesh on many levels. Hi Sue and Brett. Thanks so much for sharing your perspective. I love that you actually have two examples in front of you to consider and share about. Congratulations on your project and success. At 85%, the finish line is clearly in view now! I have never heard from a single home owner about the mesh creating any issues with wireless signals. In fact, if you look at my response to Ger’s comment in this same thread, you will see that the common misconception that wire mesh in the walls will create a Faraday Cage effect is, in fact, truly a misconception and not true. Thanks again for sharing your feedback and congratulations on your home. I know you asked for experienced perspectives, but I’m going to toss a question in also: Does it make a difference if you’re using lime or clay plaster? Is wire mesh better if plastering with lime, but a problem with using clay plaster? While welded mesh is great for structural reasons, especially for resisting lateral forces, I find it too stiff for sculpting. For that I much prefer hex net sold for stucco work. I did a beautiful garden wall by sculpting curves with this “chicken wire” which I tightened selectively by twisting wires with a needle-nose pliers to make very tight and smooth curves. Wanted to pass along this alternative use of wire. Hi—-I learned a small bit about straw bale building during a cob workshop, taught by folks using the traditional northwestern “Cob Cottage” approach. These folks don’t believe in metal in walls at all because of rust issues. What do you think about rusting rebar & wire mesh in walls? Although, to my thinking, wire mesh is galvanized & thus should be safe. We did not use metal mesh and things worked and are working fine although I would change a few things if I were to do it again. It is important to note that we did address each of your reasons to use metal mesh. and move to newer posts. 2. Electrical installations. Very good point about vampire stakes not working well. We used the bamboo poles in much the same fashion as you use metal mesh. Our electrical boxes are attached to a barbed stake driven in AND screwed to the bamboo poles. They are very secure. If I were to do it again, I would specifically site a pole for each box, even if it meant adding a redundant (for wall strength) third or fourth pole crossing a bale. Because we didn’t think to do this some of our outlets are a few inches away from our optimum preferred location. 3. Cabinet backing. Very important. We added horizontal and/or vertical 2x4s embedded in the bales at every place where we knew we were hanging something heavy and every place where there might even a small chance that we will want to hang something later. We attached the 2x4s in a fashion similar to electrical boxes—spiked to bales and screwed to the bamboo poles. The spike was probably not necessary, the strength comes from screwing to the structural bamboo. I checked by doing chin-ups at each installation. 4. Shaping. Here is where I would use metal mesh. We shaped our curves by stretching burlap from posts/framing/bamboo poles. It felt tight, but when we got to plastering, we had some difficulty because there was some give. When I do it again, I will devise a way to attach metal mesh and stretch that around my window and door curves. 5. Stuffing. Same as above. We stuffed behind some of our curves and the burlap stretched a little. Metal mesh would have been more solid. We did not have problems stuffing anywhere but our curves. 6. Spanning over wood. We made extensive use of blood (diamond) lath to span any wood wider than about 3/4 inch. 90% of our plaster was clay/sand “earth” plaster from our building site, and was easy to apply directly to the bales (after they had been sprayed with clay slip) and to the blood lath over wood. Because the earth plaster is friendlier to wood than lime, we did not apply roofing felt under the lath. The earth plaster draws any moisture from the wood rather than the other way. My few direct lime applications are isolated from the wood. Good points Deon. One thing I hear from time to time is the argument (not that this is argumentative at all) that building without mesh is more green. I think that CAN be true, but isn’t true by default. My reasoning is that a lot of the homes I have seen built without mesh and with a focus on being green have not been built well as a result (using inferior products for areas that require something more: flashing details, etc.). As a result, those houses need to be rebuilt or at very least fixed in short order. The amount of materials that end up going into the home and the products that end up in use, outweigh the initial attempt to stay green. My thought is thus: go as green as you can; however, be sure to build it right, THE FIRST TIME, so that you can keep your house green forever. Thanks for reminding me (us) of this Deon and for bringing the focus back to living and building green. Hi Terry. Thanks for your comment. There are some differences for sure. Here’s how I see it. I don’t put any rebar in may walls because I don’t think it works well at all for its designed purpose and it rusts and rots the straw. This is mostly because it is in the middle of the bale and when warm, moisture laden air hits the cold steel, it condenses: causing rust on the rebar and moisture damage, even rot, in the straw. Wire mesh does not have this issue for three reasons. 1) the mesh is galvanized so it won’t rust. 2) The mesh is very close to the surface of the wall so there is not a big temperature difference from the interior face (or exterior depending on which side of the wall we are measuring) and the air in contact with it. This difference is needed in order to create the condensation that would cause damage. 3) The mesh is in contact with the plaster so any condensation that is created, not barring item #2, is quickly pulled away by the plaster and dumped to the exterior of the wall. Hi Sue and Brett. Thanks for your input. The timing issue is not unusial at all, no matter what system you use. The funny thing is that contractors are not immune to this either. Sometimes things just take longer than we expect. I suppose that’s part of the deal when building. There are ways to figure it out and to get pretty accurate with the time line, but that usually only comes after a few houses when you KNOW what you and your crews are capable of. i Rick. Thanks for your input. I have used that netting in the past as well and it is “easier” to work with in terms of the rigidity; however, I have grown to prefer the rigidity of a 16g welded wire mesh. I still use the plier trick to tighten up specific areas and I find it is much faster and ultimately easier to work with in the end. That said, 14g or stronger welded wire mesh is difficult to shape with and is best left for structural use. If you plan to use 14g for your project, you can opt to buy some 16g for the curves, or just prepare to work hard to get the tight curves you want (which is very possible, just takes some sweat and attention.). have heard many people say that clay plaster and mesh does not work together. This is not my experience. I find that the clay plasters do not work well with mesh that is too tight in between the metal. This is because the aggregate (sand) does not fit between the metal and thus isolates the plaster from the wall which is not something we want. If the mesh is of big enough opening (2″ x 2″ welded wire mesh and standard plaster lath), AND the aggregate is small enough to function with those materials, then you will be fine with any plaster type. Hello Andrew, I agree with you on all 5 points. From a 30 year plasterers stand point a ridge wall performs much better over time than a wall that isn’t reinforced either with ribbon lath or welded wire mesh and lath, a 0 carbon foot print is a lofty goal and I believe achievable at this point the people I’m plastering for are looking for the job to be closed in and ready for interior work to be started. So what ever expedites the project is what the home owner thinks is best right or wrong. How would aluminium screening do if used like this? Hi. We bought your DVDs and are nearly done watching them. Very helpful and informative, thank you. I have a question re interstitial condensation and mesh having read your comments on metal in walls. Would you say there is zero risk of interstitial condensation on metal mesh particularly in the internal wall? Also do you know the life expectancy of the galvanisation i.e. if it breaks down over time and if so how long? We intend to do a lot of food preserving and even given the best ventilation the atmosphere within the house may be steam-laden for relatively prolonged periods. The outside temperature may drop to -20degC. Thank you. It would not provide enough strength to the walls and it would likely be easily “eaten” by the lime plaster over time. There may indeed be significant condensation on the mesh in this situation;’ however, it is embedded in the plaster and it will pull that moisture off and dump it to the ambient air, as long as the moisture content of the surrounding air is less than the walls. The mesh lasts a very long time. I have not heard of the mesh every decaying to date. I would like to create a home that acts as a Faraday cage. Do you have suggestions on how to incorporate that into the design utilizing the metal mesh? That’s a bit outside of my expertise, but I do know that the cage has to be continuous. As such, you would need to find a way to connect the mesh to whatever metal you use in the foundation and roof in order to complete the circuit. There are lots of choices for mesh that you can use; however, I am the biggest fan of using 2×2, 16gauge welded wire mesh for many reasons. The fiberglass mesh is easy to use and strong for the plaster, but it doesn’t provide the “extras” that metal mesh does: structural strength for the wall, out of plane resistance for the bales, etc.